Karin Rooney had always been a bit of a nervous flyer when she and her boyfriend, Chris, decided to take a vacation to New York City. When she and Chris returned to the airport to catch their flight home to Colorado that cold January day in 2009, she had no idea of the drastic turn their lives were about to take. Shortly after takeoff when Karin and Chris boarded Flight #1549, Karin heard The Noise and felt the plane shake. Chris tried to calm Karin's fears, but he also knew that something had gone horribly wrong. As the plane began a 180-turn, Karin prayed, "God, protect our plane. Gently lay our plane down. Put your angels above, below, in front and behind our plane." A voice on the intercom interrupted her prayers. "Ladies and Gentlemen, this is your captain. Brace for impact." Sink or Swim is Karin's riveting story of the day that Flight #1549 crashed into the Hudson River with Captain Sully Sullenberger at the helm, and of the miraculous survival of 155 people. Karin describes how the plane crash left her with PTSD but that through God's grace and trauma counseling, along with the passage of time, she has learned to face the day that changed her forever. Sink or Swim illustrates how challenging life can be when needing to heal from trauma. The good news is that Karin eventually experienced healing and now her passion is to help those affected by trauma, as well as to also help families and caregivers understand how to be a support to those touched by traumatic events. 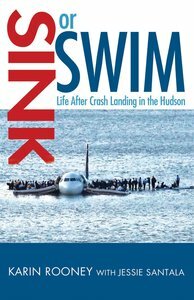 About "Sink Or Swim: Life After Crash Landing in the Hudson"